What Can a Widow Do In God's Church? How can widows serve in the Church? What is the special class mentioned in I Timothy 5? And what about the support of widows — whose responsibility is it? You will be surprised to see how much the Bible has to say about these important questions! IN GOD'S CHURCH today there are hundreds of widows. Some are younger widows who have recently lost their husbands. They may have small children at home. There are other widows who have lived alone for many years now. But, whether young or old, widows have a wonderful opportunity to serve. Have you, as a widow, ever wondered what you could do to better SERVE in the Church of God? Have you felt, because you are a woman, there is not much for you to do? YOU need to realize what a vitally important part you can play in the church and how you can better qualify to be of more service in the coming Kingdom of God! All the rest of the members of God's Church need to learn their definite RESPONSIBILITY toward the widows, as well. God has inspired His servants to write about several specific examples of widows. These examples even mime the widow in some cases. Notice how Anna served God in Luke 2:36. "And there was one Anna, a prophetess, the daughter of Phanuel, of the tribe of Aser: she was of a great age, and had lived with an husband seven years from her virginity; And she was a WIDOW of about fourscore and four years [eighty-four], which departed not from the temple, but served God with fastings and prayers night and day." Anna, well up in years, has become an example of how to serve God. This is an example of a very old lady. With all her heart and might she wanted to SERVE God. She was not able to go out into the cold and rain to serve the brethren in times of sickness or need. She probably could no longer knit or sew for those who needed clothing. The greatest service she could render God's Church and His people was PRAYER and FASTING! She did not feel left out or incapable of serving. And by fasting often, along with her prayers, she became an EXAMPLE for all generations to come. Many widows begin to feel they cannot serve effectively because they do not have large incomes and cannot send in large amounts in tithes and offerings. But have you ever stopped to think that by your PRAYERS God can and will provide Co-Workers who can send in large amounts in tithes and offerings? Ask God specifically to provide tithe-payers who are able to send in one hundred dollars or even one thousand dollars a month. Mr. Armstrong really means it when he asks you to pray for the NEEDS of the Work, as well as to contribute what you are able. Another example God gives us in His Word is the poor widow Mark writes about in Mark 12:41. Here is a prime example of ATTITUDE and service: "And Jesus sat over against the treasury, and beheld how the people cast money into the treasury: and many that were rich cast in much. And there came a certain poor widow, and she threw in two mites, which make a farthing. And he called unto him his disciples, and saith unto them, Verily I say unto you, That this poor widow hath cast more in, than all they which have cast into the treasury: For all they did cast in of their abundance; but she of her want did cast in all that she had, even all her living." This widow had her heart so much in God's Work that she was willing to sacrifice and go without so she could be a part of the very WORK OF GOD. A widow is not capable, generally, of paying large tithes and giving offerings. But when a widow does give of her need, it is pleasing to God and there will be blessings and reward for this kind of serving, humble attitude. Never underestimate the POWER and the MIGHT which God has. He is able to take the smallest offering and accomplish the greatest possible amount of work through it. As Mr. Armstrong has written in Co-worker letters, when one dollar is contributed to the Work of God, it reaches many hundreds of people when it is used to purchase radio time. So, although your offerings may be small, a tremendous amount is being accomplished through those offerings. Another fine example of a widow's service is found in Acts 9:36. "Now there was at Joppa a certain disciple named Tabitha, which by interpretation is called Dorcas: this woman was full of good works and almsdeeds which she did. And it came to pass in those days, that she was sick, and died: whom when they had washed, they laid her in an upper chamber. And forasmuch as Lydda was nigh to Joppa, and the disciples had heard that Peter was there, they sent unto him two men, desiring him that he would not delay to come to them. Then Peter arose and went with them. When he was come, they brought him into the upper chamber: and all the widows stood by him weeping, and shewing the coats and garments which Dorcas made, while she was with them. But Peter put them all forth, and kneeled down, and prayed; and turning him to the body said, Tabitha, arise. And she opened her eyes: and when she saw Peter, SHE SAT UP!" Here was a zealous widow who was so loved BECAUSE OF HER SERVICE that God saw fit to even resurrect her from the dead! This was a witness to all around, and many believed because of it. But God chose a particular widow to serve as this witness because she was so well-known and well-loved by many people. Dorcas was able to spend her time serving the brethren. She made garments and coats and saw to it that the brethren of the church were well-clothed when there was a need. Dorcas was not as old as Anna, whom we read about earlier. She was probably agile enough to spend much of her time sewing and making clothing and caring for others. Because of her tremendous zeal and her attitude, she also has been mentioned by mane in God's inspired Word. It is the example all of the widows in God's Church today should follow! There is something for widows to do! Widows should begin NOW to see the opportunities that surround them. If a widow is physically able, she can be as Dorcas who made clothing, cooked, and cared for the sick. A widow can always give her "widow's mite" to the Work of God, even though her tithe and offering is generally only a small amount of what others are able to give. A widow who is well up in years and not able to physically contribute much, can spend much time in fasting and PRAYER for others AND FOR THE WORK OF GOD! Through these services, a widow not only qualifies for the Kingdom of God, but lives the remaining years of her life on the earth in true happiness, realizing she is doing a service. Women must realize it is not their responsibility to hold offices of authority in God's Church. God inspired Timothy to write, "But I suffer [permit) not a woman to teach, nor to usurp [have] authority over the man, but to be in silence" (I Tim. 2:12). A woman cannot hold the office of teacher over adult men, or in the church. But notice, in Titus 2:4, how a woman can have part in teaching: "That they [the older women] may teach the young women to be sober, to love their husbands, to love their children, To be discreet, chaste, keepers at home, good, obedient to their own husbands, that the word of God be not blasphemed." You widows or older women have a responsibility to TEACH the younger, teen-age girls as well as the newly married young wives in the church. This is not the kind of teaching that is done from the pulpit as a minister. But this is the kind of personal instruction, encouragement, inspiration and EXAMPLE that a widow can give right in her own home or as she visits with the young women in the church. An older woman has lived many years and experienced all the things that a young girl has yet to look forward to. This is of great value. God inspired His servant Paul to instruct the older women not to neglect this important part of qualifying for the Kingdom of God — to be able to teach the younger women not to make mistakes and how to be happy! If a widow could meet certain qualifications, the Apostle Paul actually had a special class of widows who traveled with him — or with others in the ministry — to help serve as they traveled. Their job was taking care of the cooking, washing, ironing, and other routine duties which would allow Paul and the other ministers to be free to devote time serving in the ministry. Notice the qualifications for serving in this special enrollment in I Timothy 5:9. "Let not a widow be taken into the number under threescore [sixty] years old, having been the wife of one man, Well reported of for good works; if she have brought up children, if she have lodged strangers, if she have washed the saints' feet, if she have relieved the afflicted, if she haw diligently followed every good work." Not every widow in the church could serve in this special enrollment; she had to, first of all, be sixty years of age. All her children would be grown and perhaps married or away from home at this time. Also, an elderly widow such as this would present no kind of evil appearance as she traveled in a small group to serve the brethren of the church. But notice the other, qualifications! She had to be a DEDICATED and SINCERE woman. She couldn't be the kind who showed concern only for herself and her past life. She needed to be the type who enjoyed having company and serving in the home. She had to have a sincere desire to DILIGENTLY FOLLOW all the laws of God! In the Church of God today, we do not have this special roll of widows to travel with the ministry. But this does not mean there is no need for this special service widows can perform. Most of God's ministers are married and have their own families. Their wives often travel with them as they visit the brethren and there has been no urgent need for this type of service from widows. But this service does not have to be restricted to the ministry alone. Widows over sixty who have these qualifications can be of great service in each local congregation to the brethren. We may not have a special class of widows which we recognize or call by a particular title, but any widow can render her services to help the brethren. In fact, EVERY widow ought to try to live up to the standards and requirements of this special class of widows. What About the Younger Widows? There are times when a younger woman with small children will be widowed as a result of death or an accident. Naturally, for many months or for a few years, a young widow goes through a period of adjustment without a man to be head of the family. There are times when this young woman will have to go to work to provide for herself and her children. There are literally thousands of women in this world who have had to do just this — and even apart from God's law have been successful in rearing their children and providing a proper living for them. However, there are times when a young widow realizes the need for the children to have a father, and in some cases, it is not wrong for these young widows to want to marry. The Apostle Paul said in I Timothy 5:14, "I will therefore that the younger women marry, bear children, guide the house, give none occasion to the adversary to speak reproachfully. For some are already turned aside after Satan." A young widow in God's Church — who is thoroughly converted — will put this in God's hands! Far too often, a woman will simply "seek a husband.'' Sometimes, she will pay no attention to the advice of God's ministers and consequently will find herself in a very unhappy marriage. Every young widow should do all within her power to make provisions for herself and her children. If she is being diligent and faithful to the Word of God, God will supply all her needs. If by patient and constant PRAYER, and if it is God's will, He will supply the proper head of the family to be a stepfather and husband. In every case, a young widow needs to be constantly aware of the temptations that surround her and not to, its Paul said, "turn aside after Satan." Remember the attitude and problems some young widows might have in I Timothy 5:13, "And withal they learn to be idle, wandering about from house to house; and not only idle, but tattlers also and busybodies, speaking things which they ought not." This, brethren, is the common tendency — this is what is likely to happen — when young widows are not diligently trying to meet their responsibilities, both to their family and to God. The goal of a young widow should not be marriage — it should be to meet the responsibilities which have now been laid upon her and to qualify herself for the Kingdom of God. Her goal is the same as the goal of any Christian — to be born again! Her responsibilities very likely will require her to be out working and earning a living to support her children, if there are no visible means of support otherwise available. So far, we have seen how a widow can serve and help in the church. We have read many scriptures on how a widow can better qualify to enter God's Kingdom and be happier here and now as she serves in God's Church. But what about the rest of us in God's Church? What about some of us who might have mothers or grandmothers who are widows and also who are members of God's Church? What can we do if a widow has need? The very heart and core of a Christian life is summed up in James 1:27. "Pure religion and undefiled before God and the Father is this, TO VISIT THE FATHERLESS AND WIDOWS IN THEIR AFFLICTION, and to keep himself unspotted from the world." Yes, each member of God's Church has a particular responsibility, toward the widow — as well as the widows having their responsibility to serve and help the other brethren when it is possible. The whole reason for living a Christian life is to be of service! Jesus Christ said that if we wanted to be great in the Kingdom of God, we must he a servant. In the sixth chapter of Acts, the early New Testament Church was faced with a situation that resulted in the selection of Deacons for God's Church. Notice it beginning in Verse 1, "And in those days, when the number of the disciples was multiplied, there arose a murmuring of the Grecians against the Hebrews, BECAUSE THEIR WIDOWS WERE NEGLECTED IN THE DAILY MINISTRATION. Then the twelve called the multitude of the disciples unto them, and said, It is not reason that we should leave the word of God, and serve tables. Wherefore, brethren look ye out among you seven men of honest report, full of the Holy Spirit and wisdom, whom we may appoint over this business. But we will give ourselves continually to prayer, and to the ministry of the word." Then, seven men were selected to fulfill the office of Deacon in order to allow the ministers to have time to take care of the spiritual duties they would have in serving God's people. In the very beginning years of the church the need to help serve widows was pointed out. And because of the need to serve widows, the office of Deacon was actually inspired. Many of you reading this article are now married. We trust every converted member of God's Church will read this article to learn. Even though we don't like to think of it, we must all realize that it is possible that sometime in the future our wives will be widowed and left without financial support. What is your obligation to your wife and family? In the Bible, God says a righteous man will lay up for his children and his grandchildren. God shows that saving for the future is a right principle. He also gives us the example in Proverbs of the ant who goes out in the summer and works diligently to lay up ahead for the coming winter. This is an example for us! Many have wondered about life insurance. 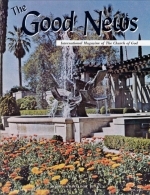 About two years ago, Dr. Herman L. Hoeh wrote an article for The GOOD NEWS magazine on this very subject. All of you should be certain you have read that article. It is a wise man who will spend only a few dollars a year to provide fur urgent needs and family support should his life be taken. Far too often we do not think of these things and our families can suffer greatly should an accident occur in our lives. Do you know that if you have a relative in God's Church who is a widow and has no means of support, you have a direct obligation to her according to the Scriptures? Notice it once again in I Timothy 5:4, "But if any widow have children or nephews [this should be translated grandchildren], let them [the children and grandchildren] learn first to shew piety [or kindness] at home, and to requite [offer support for] their parents: for that is god and acceptable before God." Yes, if a widow in God's Church has children or grandchildren who are also in the church, those children have a DIRECT RESPONSIBILITY to provide for the support of that widow if there is no other way for her to be supported. And notice again in Verse 16, "If any man or women that believeth have widows, let them relieve them, and LET NOT THE CHURCH BE CHARGED; that it may relieve them that are widows indeed [or who have no other means of support]." And again in Verse 8, "But if any provide not for his own, and specially for those of his own house, he hath denied the faith, and is WORSE THAN AN INFIDEL." Some members of God's Church have neglected this. Some have not realized before this direct responsibility placed on every member of God's Church if he has a mother, mother-in-law, or grandmother who is converted. In other words, a widow who has relatives in the Church of God is not eligible for third-tithe support from the church. If this situation exists with any of you, you should begin as quickly as possible to relieve this obligation from the church and begin TO SUPPORT YOUR WIDOWS so you will receive God's blessing for being completely obedient to all of His laws. Today's present society offers many provisions for the care of widows. First and foremost, every family ought to consider this need while all members of the family are still living. As mentioned before, life insurance is a possible answer. Savings and investment in properties for future need is another solution. However, for those who are already widowed and have not been able to have these savings set aside, there are means of support offered by our government. Most working people have paid into the SOCIAL SECURITY plan. Social Security is a payroll deduction plan where every employee must pay a certain amount of each check for his retirement in old age or toward support of his widow should he die. The employer has contributed to this fund as well. In case of need or old age, every family is left with a small income on which they can get by. In most cases, Social Security is required, and many of you have been paying benefits for many years. Many widows in God's Church are supported today by Social Security. Another means of support for widows and elderly people is the OLD AGE PENSION. 'This is a tax-supported plan set up by the United States Government. All of us pay taxes. We are to render unto Caesar the things that are Caesar's, and this we gladly do for the privileges of living in our country. If a widow is left without support or a person reaches old age and has no means of income, our tax dollars can support them in part by the Old Age Pension plan. If neither Social Security or Old Age Pension can be received, there are generally County and City Welfare Agencies which offer support to elderly people and to widows. This is also a tax-supported plan and members of God's Church have every right to be supported through this means if it is necessary. In addition to what the government of each country sets up to support those in need, God has seen fit in His law to establish a special fund to provide for the support of fatherless children, widows, strangers and the Levites who have need. God has always financed and supported HIS WORK by a system called tithing! This is God's way to do things. A tithe is one-tenth of a person's income. First of all, one-tenth of every wage-earner's income is not really his at all — BUT IT IS GOD'S. This tithe is clearly demonstrated in the Bible to be used only for the WORK OF THE MINISTRY and the publishing of the Gospel around the world. It can be used for no other purpose! If it is held back we are robbing God! (Mal. 3:8-12). In addition to this tithe for the work of the ministry, God has liberally provided a plan for our vacation every year. It is set up on the same tithing principle. Notice it in Deuteronomy 14:22, "Thou shalt truly tithe all the increase of thy seed, that the field bringeth forth year by year. And thou shalt eat before the Lord thy God, in the place which he shall choose to place his name there, the tithe of thy corn, of thy wine, and of thine oil, and the firstlings of thy herds and of thy flocks; that thou MAYEST LEARN TO FEAR THE LORD THY GOD ALWAYS." This tithe is to aid you in travel expense and meals for the annual Feast Days held every year — especially the Feast of Tabernacles. However, did you notice that this tithe is not for the work of the ministry — rather it is for every individual to eat and to enjoy. Yet, to insure attendance at these Festivals and to be sure all of God's people are properly taught — God instituted this "SECOND TITHE" as an absolute law! On this same tithing principle, God has established the means whereby widows and others in need can have provision. Notice it in Deuteronomy 14:28, "At the end of three years thou shalt bring forth all the tithe of thine increase the same year [the third year], and shalt lay it up within thy gates: And the Levite, (because he hath no part nor inheritance with thee,) and the stranger, and the fatherless, and the WIDOW, which are within thy gates, shall come, and shall eat and be satisfied; that the Lord thy God may bless thee in all the work of thine hand which thou doest." Here, then, is the "THIRD TITHE." This tithe is not taken every year as are the first and second tithes. This tithe is to be taken only in the third and sixth year of a seven-year cycle. In other words, the third-tithe year for every member of God's Church who is a wage-earner and has an increase is to be paid only two years out of every seven years — the third and sixth years. These years are generally counted from the time of one's baptism. So, the third and sixth years after an individual is baptized are his third-tithe years. The tithe of that year is given to God's Church for the support of the fatherless, the widow and the stranger. This, of course, is in addition to his regular first tithe which is given for the work of the ministry, and the second tithe, which is to be used for the annual Festivals. If God's people will be faithful in supplying this third tithe in the appropriate year, we will not have to worry about the support of widows who have need. However, if some in God's Church feel it is not important to save back this third tithe and to contribute it for this support, there will not be sufficient funds for the church to provide where there is a genuine need. Brethren, if you have not faithfully saved your third tithe, you must BEGIN TO DO SO in your third and sixth years if you ever expect to receive God's blessings and ultimately enter His Kingdom! Remember the promise in Malachi 3 is that God will "open you the windows of heaven, and pour you out a blessing, that there shall not be room enough to receive it" (Mal. 3:10). But it is only by being faithful to God's law that God can bless us richly. And our blessings then go to contribute to and help support the widows, fatherless and those who have a need and are eligible for it under the boundaries of God's law. Widows play a very active and important part in the Church of God. The Bible specifically gives many illustrations in the lives of widows. These examples show that there is much for a widow to do in God's Church. She is to be a teacher of the younger women and an example for them to follow. She is to serve and help physically in the Church wherever possible. And she is to direct her time to fasting and prayer so the entire Work of God can surge ahead as a result of the prayers of its members. Through these means, a widow can and should feel she has a definite place in God's Church and in the soon-coming Kingdom of God. She, too, will reign and rule with Jesus Christ!